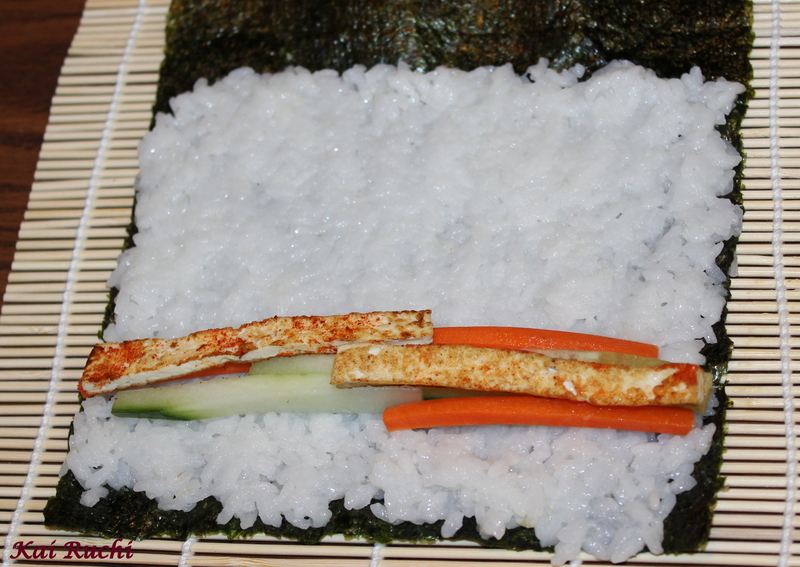 Being a vegetarian, I get to try very few types of vegetarian version of sushi’s at restaurants near my place and wanted to prepare one of them at home. Believe me, I have been trying to do this past one year. Last year I bought the sushi mat from amazon and kept it inside since I had not bought any other ingredients and forgot about it. Then I had my mom visiting us and I was very sure, she wouldn’t try it and I did not feel like making it. 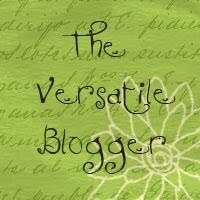 So I got some time to browse over few sushi recipes and bookmarked it. Very recently did I get a chance to buy the rest of the ingredients and prepared it. Never the less, I guess it was worth the wait and I was not disappointed with the outcome and enjoyed it thoroughly with my family! Cook rice according to the directions provided on the packet. The rice must be a bit mushy, once cooked mix it well with vinegar and keep aside. On a flat surface, spread the sushi mat. Place the sea weed sheet on top (slightly toasted sheets gives a crispy texture) and add enough rice so that you cover 3/4th of the sheet. 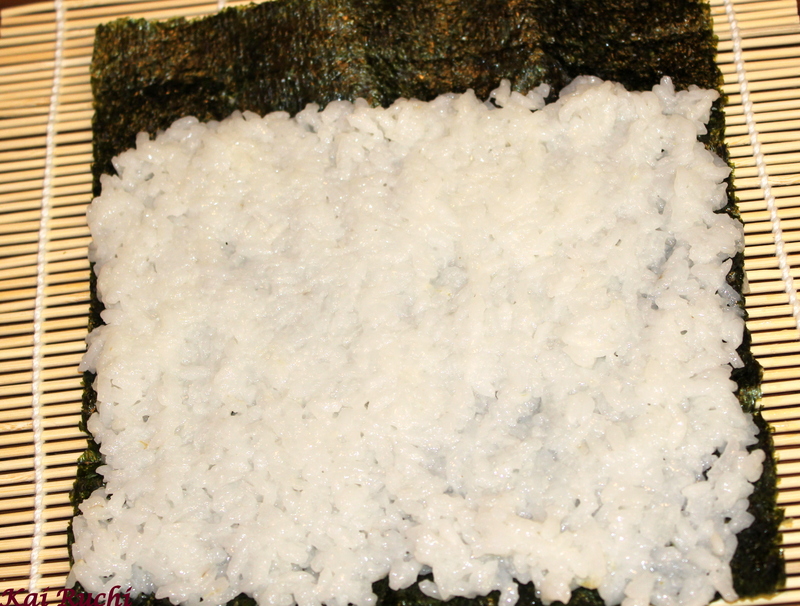 Spread the rice grains 1 inch thick and make sure it’s tightly packed. 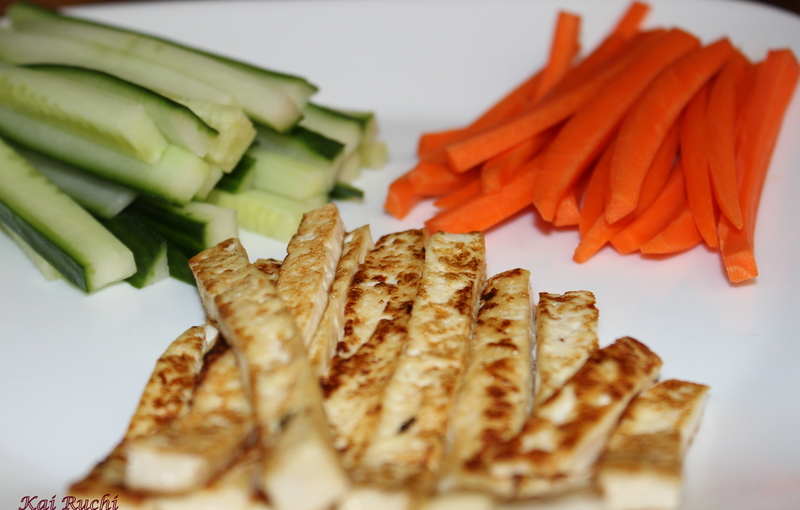 Place 3- 4 strips of carrots, zucchini, and tofu lengthwise on the rice on one edge. 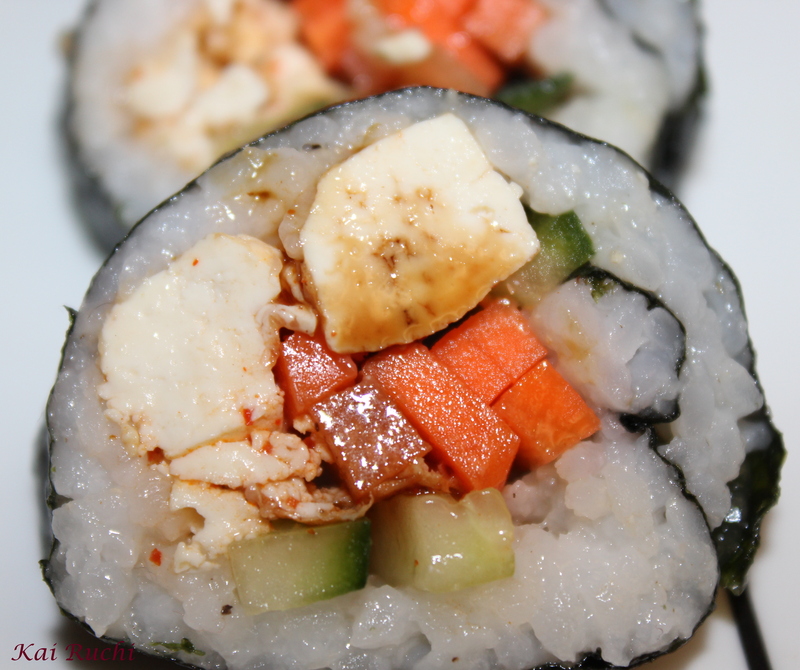 Place your fingers next to the vegetables and start rolling it tightly until you reach the end where there is no rice. 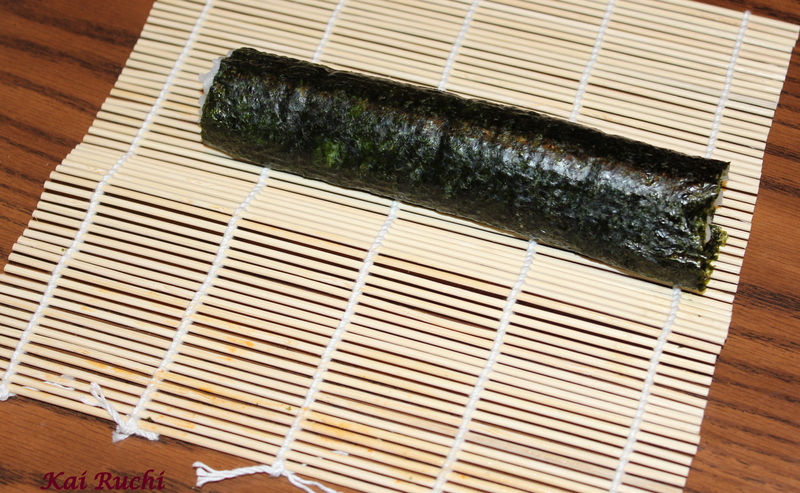 Tap the edge with little water and roll the sushi completely. Tapping with water allows the edge to stick well. Now cut 1 inch of the edges on both side and keep aside, cut the rolls into bite size pieces. 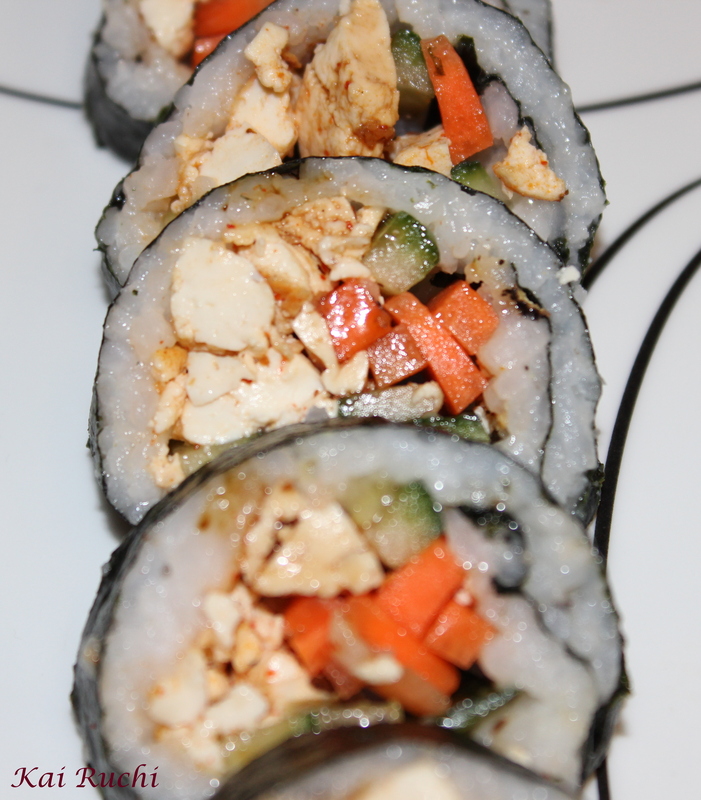 Dip the rolls in soy sauce and enjoy!